Lambert & Rehbein was commissioned by Sedgman (on behalf of Bechtel EPCM) to undertake Civil Engineering Design Services for the South Walker Creek Coal Handling facilities owned by BHP and Mitsui Coal (BMC). Detailed design and documentation of civil earthworks was required in preparation for the construction and installation of new coal handling infrastructure to increase output at South Walker Creek. The work involved the delivery of the design and material take offs for the new CPP and ensuring design compatibility between the new and existing CPP interfaces. 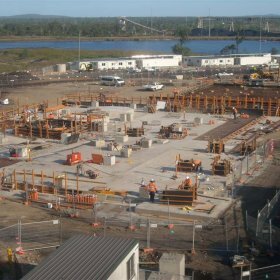 Levels and foundation pads for the Temporary facilities including services and stormwater drainage for the construction phase activities were part of the design deliverables. The necessary pipework (PE exposure specification) alignment and pumping requirements for movement of Grey Water via rising main were provided for the Crib facilities.